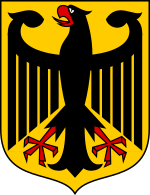 The coat of arms of Germany (German Wappen Deutschlands) is a symbol of Germany; the coat of arms feature an eagle. The coat of arms are similar to those of the flag of Germany (black, red and gold German: Schwarz, Rot und Gold). It is the oldest existing state symbol in Europe and is one of the oldest insignia in the world. Its history as an emblem is far longer, however. To the Germanic tribes the eagle was the bird of the god Odin, and by the Romans, too, it was revered as the symbol of the supreme god, of the emperor and of invincibility. From there and through its religious significance in Christendom it came to be incorporated into medieval symbolism. This page was last changed on 7 September 2016, at 01:22.